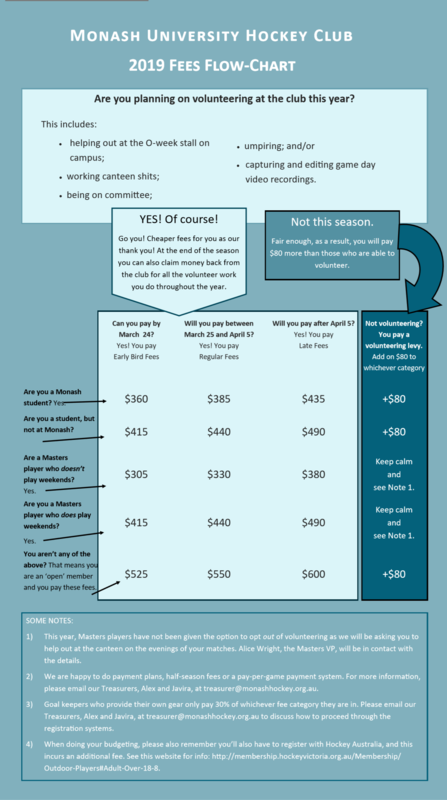 The Hockey Australia Portal – where you will pay a Hockey Australia registration fee AND a Monash University Hockey club membership fee (see above). Click HERE. The Monash University Portal – This is brand new and super important. It ensures we have access to accurate information and are able to better respond in any emergency. It also ensures that you are fully covered by the Monash Sport insurance. Click HERE. Registration takes under 20 minutes and can be done in 11 easy steps. Step 1: Chuck tinyurl.com/HockeyAus into your browser. This takes you to the Hockey Australia Portal. Log in with your old Hockey Victoria email address (or make a new account if needed). Please note: this works best on a computer, not a phone. Step 2: Click your name (if you’re returning to your old account). Step 3: Enter your details. Step 4: Tick ‘Hockey Australia – Senior/Junior Player Levy’, ‘Hockey Victoria Adult/Youth Outdoor Playing membership‘ AND a Monash Hockey membership (see image below to confirm which fee category you fit in to). Step 5: Add some more details. Step 7: Enter your payment details and pay. Pro tip: to avoid credit card fees, use PayPal! Step 8: Chuck tinyurl.com/MonashPortal into your browser. This takes you to the Monash University Portal. Click ‘Join or Renew’. Step 9: Sign in (or create an account). Step 10: Click ‘Join’ for your member type (most people will be ‘2019 Hockey Players’). Step 11: Fill in each of the forms with your details. The following fee structure is in place for the 2019 winter season. We’ve had a restructure from 2018 and things are looking a little different, for more information on fees and the new Volunteering Levy (previous the non-CAPS payment), please click HERE. and follow the below instructions to register. Step 4: Select the 3 options below and click ‘Next’. Once this is done, please transfer 25% of your Monash fee on the 1st of each month, for four months, starting on the 1st of April, to the club bank account details are listed below. Use your name as a reference. Unfortunately, under the payment plan, you are not eligible for any fee discounts. If a player is transferring IN to our club, they should request the transfer BEFORE registering as a Monash Player. This is the simplest method for transferring a player. Hockey Australia (HA) and Hockey Victoria (HV) have imposed administration fees for every player. These fees include insurance cover and entry into the State Hockey Netball Centre for 2019. For all inclusions please visit the HV website. Members will receive a digital ‘membership card’ at the club which will need to be scanned when entering the SNHC using a mobile phone app. Failure to present your membership card at the SNHC will result in members needing to pay at the gate as per previous years, with the income from the gate going directly to the State Sports Centres Trust (SSCT). It is important to understand with a gate fee being collected via the ‘HV Membership Registration’ the money remains within hockey, ensuring that we can continue to invest into development programs and initiatives to improve the sport. If you are not registered by round 1 this means that you are also not insured if something goes wrong. If this is the case you will not be allowed on the pitch.